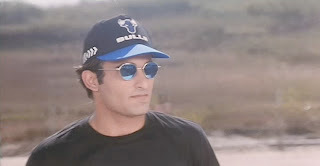 Let's be honest: I watched this movie so I could review it for Jaman - and, more importantly, for Akshaye. And all of a sudden I felt a new, if flimsily-based, appreciation for Roger Ebert and the like who sit through mountains of crap because they have to. I should have known, right? Yikes. This shifts in tone of this movie are very, very awkward, and it is littered with both contextualized and completely random violence far beyond what even its basic plot entails. The "We hate each other! No wait, we love each other!" buildup of the love story has its cute moments, but Urmila's character Madhu is completely irritating and it's very hard to understand why Akshaye's Vijay likes her - or even gives her the time of day. The second part of the film is a bog of history (which explains why Vijay's parents have such fake-looking gray hair) and revenge, and despite all of the action sequences, complete with waaaaaay overdone punching sound effects, it's dull. 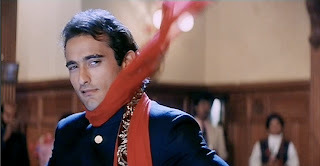 Even if you're as Akshaye pagali as I am, Humraaz and Deewangee (also with Urmila and greatly aided by Ajay Devgan) are better, less annoying ways to get your fix of Akshaye in action-star-ish mode. And although I can't think of any off the top of my head, I'm sure there are far better examples of romantic comedy + revenge drama out there. That is, should you want such a thing as either Akshaye in action-star-ish mode or a movie that combines romantic comedy with revenge drama. I will give it this: Kudrat features a truly great example of the girls vs. boys engagement party song, "Ab Tak Hai Puri Azadi," which is probably my favorite type of standard Bollywood picturization. What made this song great for me is a little twist of the intergenerational and interfamilial dancing, which I don't recall having seen before. 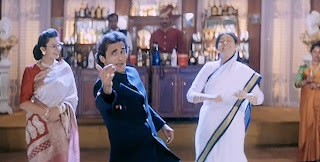 Speaking of which, this is a jackpot of wavy-haired wooing, smiling, and dancing Akshaye (when he isn't being beaten up or beating other people up), and I've got the screen captures to prove it. He does a lot of arm-flings, walks dreamily around trees as Urmila shimmies about, and even rides a tractor, reminding me of Footloose in a really good way. His carefree rich boy character enables him set loose the slighty cocky, good-natured, "I sure am having a great time making this movie, check me out!" vibe of his dad, and that was really fun to watch. He has most certainly had more interesting and more empathetic roles, but as usual he does his best with what he was given. With one exception: I believe I have previously aluded to my dislike of Akshaye's tendency to follow the Al Pacino method of expressing anger, which is to talk at a normal tone and then all of a sudden start yelling. Loud = full of rage. Got it. He's angry a lot in this movie, and it got old fast. There's nothing exciting about either the role or his performance. There's nothing special about this movie at all (yet note how long I can talk about it - sorry about that). It's not the most horrible thing ever, and the ways in which it is bad are neither interesting nor entertaining. It's dangerously close to an "avoid, yaar! ", the lowest of the low. It's saved by the song mentioned above (which I would tell you to watch online but I couldn't find it) and adequate performances by all the leads. Isn't it sad that "adequate" is saving a movie from being a complete waste of time? That's what we're dealing with here. * See? So much to stare at. As someone who frequents Chicago, I was delighted by this one. And it matches his sunglasses! Somebody do something with this subtitle, please. The best entry gets a prize. The movie must have been made in various stages, because here he has what might be his best hair ever. Ever. Re: I'm wearing my pant - for one thing - in Subtitlese, the verb phrase "to put on" doesn't exist, so "put on" is always translated as some form of "wear." Re: I´m wearing my pant. You just have to read it in the right context with the proper pronouncation. "I AM wearing my pant"
Great screencaps! Enough to make me want to watch this film, even if it isn't that good. 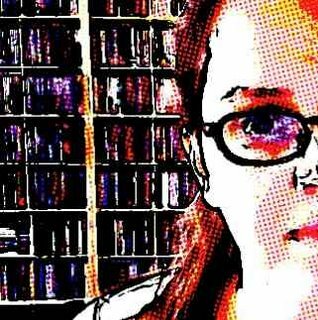 Beth - how would you like to post at Desicritics? I would recommend you see the old "Kudrat" made some time in early 1980s - it stars Hemamalini, Rajesh Khanna, Vinod Khanna (ur fav Askhay's real dad! ), Raaj Kumar and Priya Rajvansh. I recently saw it on DVD and liked it very much - story, acting, music etc. Amrita - it's so funny you say that - I have actually just been registered to post at Desicritics, and I had hoped Kudrat would be my first post there, but then the movie was so uninspiring that I didn't think I would have anything Desicritics-worthy for my debut! :) I should have things up there next week, though, once I have time to watch some better movies! And PS I loved your piece on Karan Johar and marriage. Oh wow. You WERE right. I DID melt. :D Why he got to be so hot??? :| It's not....healthy! Darshana - I meant to say earlier: thank you for filling me in on that! I'm still only in chapter 1 of my Teach Yourself Hindi book. Babasko - that is far less saucy than I know you are capable of. Nisha - yay! As for how it happened, well, if Vinod's your daddy, it'd be hard to be ugly. And personally I do prefer him when he has more hair like this - I've read the rumors that he's balding, but that doesn't mean he has to shear it so short like he's been doing lately. :) And I've got tons more s screen captures if you'd like a gift email. 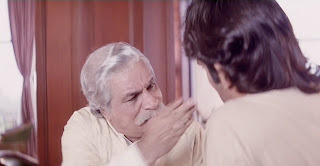 The old "Kudrat" is really worth watching for story, direction, music, lovely locales (Simla and other places) and acting - all have done well. Pls do watch it when you have a chance or have the time!